Like any other cosmetic surgery procedure I perform at my Spokane practice, liposuction is associated with a lot of myths and preconceived notions. They come from hearsay handed down via the “I know someone who knows someone who had it” chain, and from not-altogether-accurate portrayals of cosmetic surgery in popular culture. These are the ones we hear most often. It’s easy to see why someone may think that this is true: We are, after all, removing fat from the body. But the myth is really rooted in a larger narrative of seeing liposuction as “the easy way out” of getting down to your ideal weight. To put it plainly: There is no easy way out. Although liposuction can be performed on patients who are overweight as a jumpstart in the right direction, we prefer to see a willingness and a plan to lose weight and maintain their results after the procedure. However, a more ideal patient for liposuction is already at (or very near) their ideal weight — and in most cases, they’ve gotten there through a diligent fitness regimen and a healthy diet. Rather than thinking of liposuction as a way of reducing your weight, it’s more accurate to think of it as sculpting your body in a way you’re unable to on your own. Liposuction is meant for those stubborn pockets of fat that diet and exercise alone can’t address, not for removing any and all fat. Myth #2: After liposuction, you’ll have loose, sagging skin. This one is closely tied with the first myth. The logic goes something like this: Because you’re removing so much fat, the skin left behind will become saggy. In a liposuction procedure, the amount of fat removed is noticeable, but it’s not enough to overwhelm your skin’s ability to retract around your new body contours. Patients with good skin elasticity prior to liposuction retain that elasticity afterward. Smartlipo™, my preferred liposuction method, has an added benefit. The laser technology used in a Smartlipo procedure actually triggers collagen production in the skin cells after the fat is removed. Those skin cells then naturally tighten, producing smooth contours like those in the example above. Myth #3: Liposuction can treat cellulite. What’s important here is to understand what actually causes cellulite. Contrary to popular belief, it’s related to fat, it’s not just the fat that causes the lumpy appearance. Bands of connective tissue pull down on the skin from underneath, and this can cause the fat cells pushing up against that tissue to form the bumps we know as cellulite. Our noninvasive cellulite treatments typically focus on the more superficial fat and skin layers, as opposed to the deeper areas of fat removed via liposuction. The use of the laser, not the suctioning is really the reason cellulite improves during laser assisted liposuction. Myth #4: Liposuction is for large areas of the body. The myth here is that liposuction is only for large areas of the body. Smartlipo can certainly be effective in the most common liposuction treatment areas (e.g., the midsection, the flanks or “love handles,” the thighs), but its especially narrow cannula (only 1 millimeter wide) makes it adept at addressing smaller areas with a minimal incision, too. 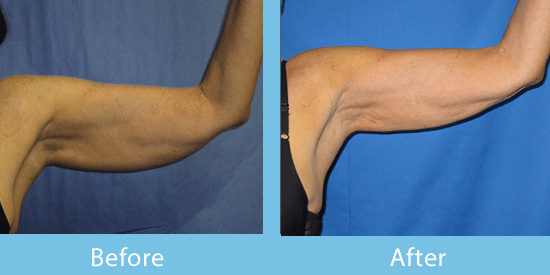 You can see an example with this past patient, who wanted targeted liposuction on the fat under her arms. Smartlipo is also a good choice for chest or neck fat. In general, liposuction is a very versatile tool with multiple applications in cosmetic surgery. If there are myths about liposuction, or any other cosmetic procedure, that you’d like to have cleared up, leave a comment below. What is the average cost of liposuction to underarms and how many treatments does it take? I had gastric bypass surgery several years ago. I have loose skin that I haven’t removed. Can lyposuction help with that. Hi Kris, thank you for your question. Typically after gastric bypass and significant rapid weight loss the skin is stretched to the point that liposuction is probably not the correct procedure. If your concern is mostly loose skin, then a body lift procedure where the excess skin is removed is the most common procedure. Feel free to call us directly and we can discuss the situation further at (509) 209-2171.